Ore is a basic resource item, usually obtained by mining Asteroids. Using a Hand Drill or ship-mounted Drill will destroy the rock and release the Ores as objects in the world to be collected. While useless on its own, Ore can be processed in a Refinery or Arc Furnace to be turned into a useful Material. 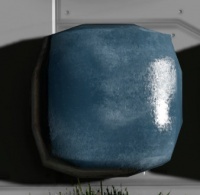 Identifying ore patches purely by sight can be frustrating, especially if there are two similar ores next to one another (such as Platinum and Silicon). It is for this reason that an Ore Detector is always highly recommended for the initial identification process. The Hand Drill has a small Ore Detector built in, whereas a ship-based Ore Detector has a larger detection radius. This will put the name of the ore on the HUD in approximately the center of the ore patch. However, once you have identified the vein you wish to obtain, it can often be more effective to rely on sight to guide your mining, and so a Spotlight is almost always useful for this purpose, to more easily see where one vein ends and another begins. See the images and descriptions in the table below for more information on each ore.
Ice Ice Blue. Blue and White, Shiny. 2.7 Kg 1 L ? This page was last modified on 1 August 2018, at 22:28.